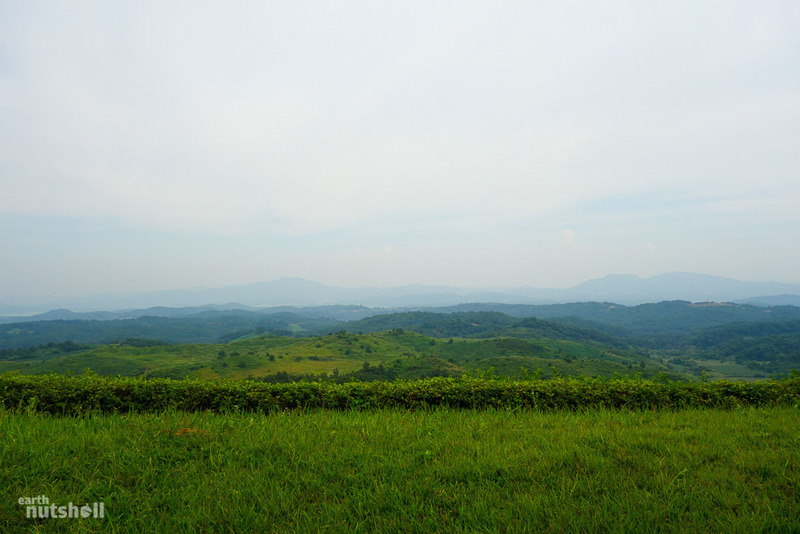 In a Nutshell: As the tale goes, spanning the entirety of the Korean Demilitarized Zone (DMZ) sits the ‘Concrete Wall’, a barrier built by South Korea to split the Korean peninsula in half, segregating North Korea into isolation and preventing reunification. During a visit to North Korea, I was taken to view this seemingly undocumented wall. So, does it really exist? Or is it simply North Korean propaganda? Fact or fiction — read ahead to hear my take! “The wall is a result of the hostile policy pursued by the USA and South Korea against unification,” exclaims Kim Chang Yun, a trusted colonel of the Korean People’s Army with over forty years service. Within earshot, I was otherwise preoccupied gazing intently down the twin barrels of 1990’s finest binoculars, panning for refracted light resembling that of the Concrete Wall, North Korea’s own fabled Loch Ness Monster. 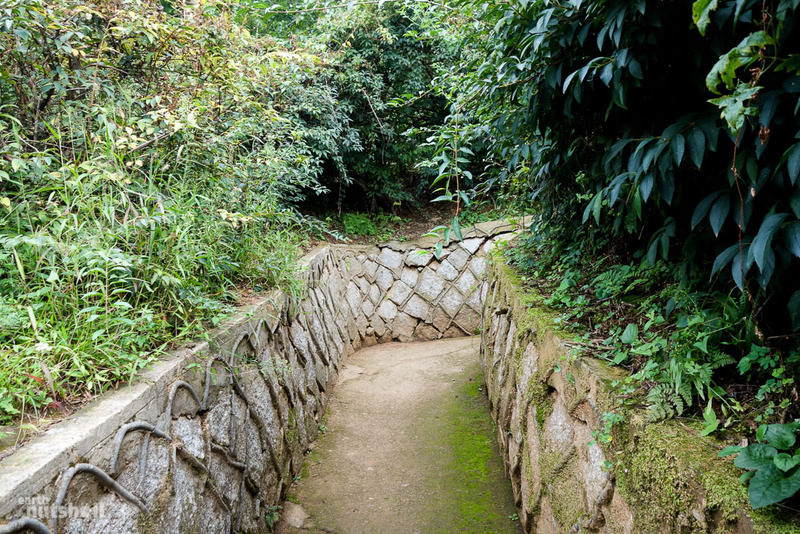 I was on the front line of Korea’s Demilitarized Zone inside a cold stone bunker preceded by a crumbling overgrown trench laced with moss. To my left, a sandbagged outpost situated on the high ground manned by three Korean People’s Army soldiers, one was resting, leant up against a mounted machine gun. Together, we all stared across into South Korea. The enemy. At least for the duration of my visit. Do as the Romans do, it’s never felt quite so important. By being inside North Korea it was my legal obligation. “Do you see it?” I asked a fellow tourist, seeking solace in a majority decision. “Not yet” he responded, optimistically. What’s the big deal anyway? It’s just a wall, I hear you thinking. 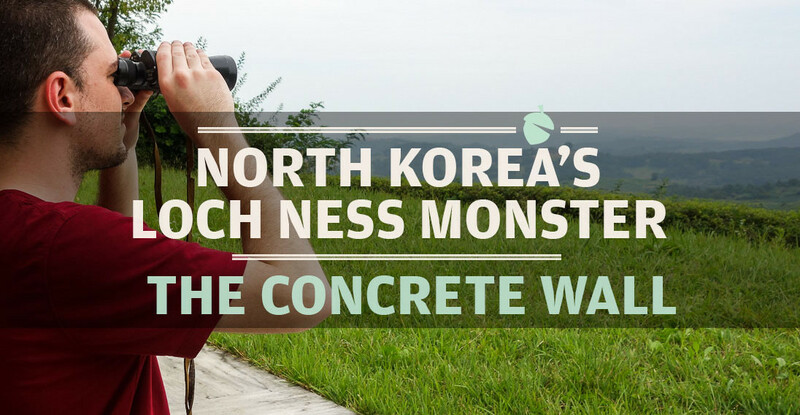 Well, the Concrete Wall spans 240 kilometres across the entire Korean peninsula, cutting it in half. Built by South Korea, it’s said to physically segregate the North from the South. The wall is 5-8 metres high, 10-19 metres thick and dotted with military establishments and lookouts. Think the Great Wall of China, except in Korea, and as relevant today as the one in China many moons ago. Interestingly, North Korea’s exclusive news source named KCNA claims that the wall can only be seen from the North Korean side. Yet, this was a claim backed equally by each of my five North Korean guides. 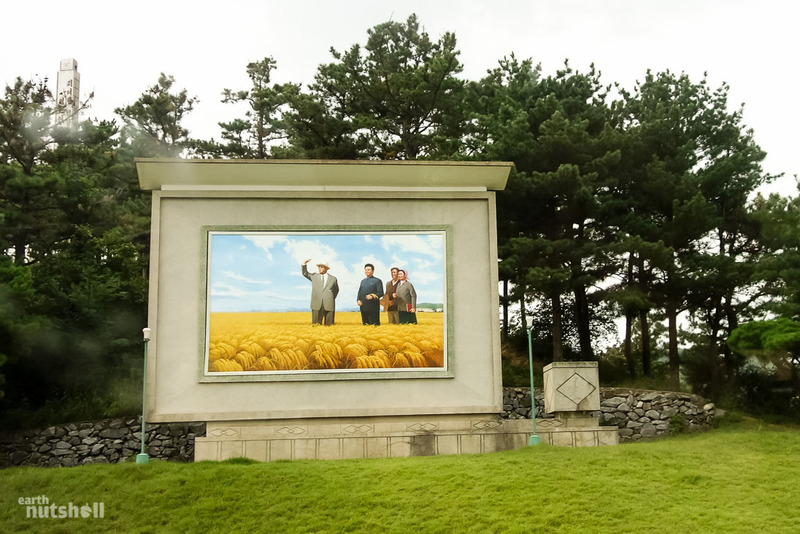 A farming mural featuring Eternal President Kim Il-Sung and Chairman Kim Jong-Il. Crops as far as the eye can see, a celebration of agricultural prosperity. This mural was in a countryside town on the way to the Concrete Wall. The trench leading up to the Concrete Wall’s viewing bunker. The wall’s discovery was in 1989 by North Korea’s posthumous Eternal President Kim Il-Sung, just mere weeks after the fall of the Berlin Wall (perhaps not a coincidence?). It’s become a mainstay in North Korean victimisation propaganda and the catalyst to political instability on the peninsula ever since. Each New Year the South is shamelessly reminded of its existence. Proposed policies are misdirected back to that darn Concrete Wall, the “barrier of national division” as Dear Leader put it, which forcefully suppresses his people’s right to freedom and tireless North Korean attempts at reunification. Yes, that’s the official line. In North Korea, the injustice of the Concrete Wall is widely known by all as it’s systematically indoctrinated from a young age. It’s their Pearl Harbour. In South Korea, it’s a well-guarded secret. You’ve never heard of it. Neither had I. But today I’ve been driven almost an hour parallel to the Demilitarized Zone for a chance to witness it for myself. The only problem to all of this is: The Concrete Wall didn’t appear to exist. Colonel Kim Chang Yun has been loyal to the Korean People’s Army for over 40 years. He has now been given the role to induct visitors on the intricacies of the Concrete Wall. Before our viewing, we were formally addressed by Colonel Kim Chang Yun. He spoke with an air of superiority and passion, an influential charisma hand-picked by Marshal Kim Jong-Un himself for this trusted role. Not just any role, his job description involves delicate foreigner interaction which is an impossibility for regular citizens. Those given such an opportunity are strictly vetted to ensure quality control at a State level. His voice echoed around the room like a lecture theatre as he aggressively tapped the wall, mapping it out with his stick. “The wall’s main objective is to stage a military strike against the Democratic People’s Republic of Korea, to strike us with ease,” he began, an aspect he ensured we understood. Today wasn’t his first rodeo. Scripted or otherwise, there was passion. You can see this passion in the eyes of North Korean guides the country over. It’s clear this topic was his life’s work. To his left, the exact dimensions of the wall were inscribed on the map as if personally measured. As were the construction dates. The official statistics of the Concrete Wall. Vivid descriptions and artistic impression bring the wall to life for the North Korean people. The wall is easily imagined, maliciously constructed by the ‘puppet’ South Korean forces under American imperialist order, coincidentally aligning into a preexisting blanket hatred of the United States. “The Americans are responsible for all the pain and suffering of our nation.” Colonel Kim Chang Yun remarks. This is an opinion held by every North Korean citizen, it’s the cornerstone to their nationalistic pride. They learn it early, this deep victim complex has personified North Korea for decades and it remains stronger than ever into the 21st century, a concept difficult to comprehend in the age of information. 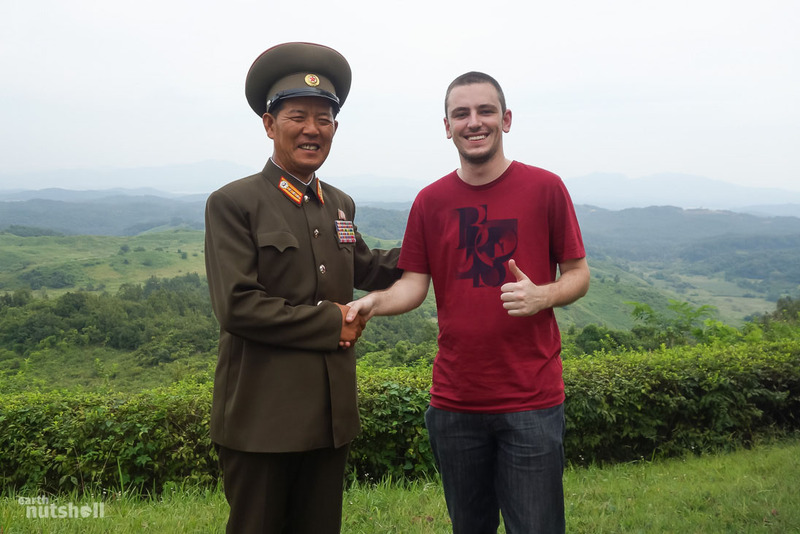 Really, I can’t appropriately explain to you how odd it is to visit North Korea. 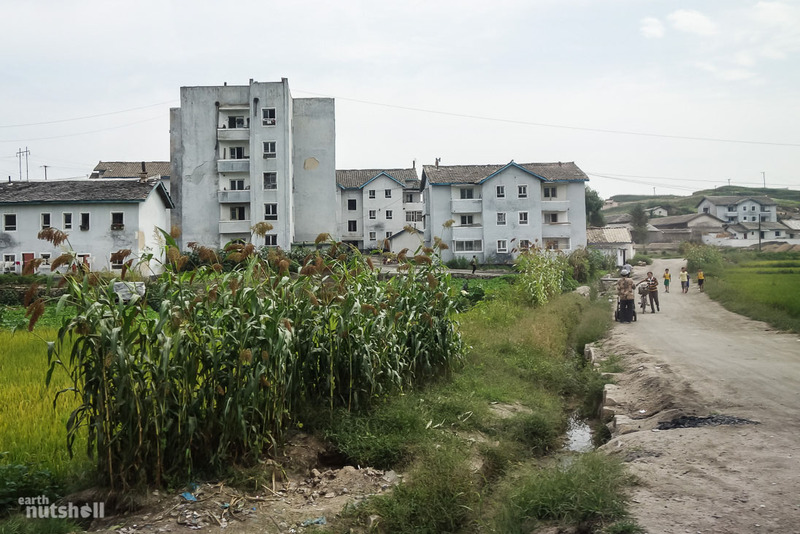 To one moment be scrolling censored social media in China to landing in Pyongyang, the capital hub of freedom deprivation so intrinsic that it makes China look like Switzerland. I’m not just talking in the physical sense either, nor freedom of expression, but with freedom of knowledge. I know what to expect but this really hits me on visits to North Korea. There is no internet, no public libraries, no international texts and all news broadcasts are censored. Even the music is state approved and endorsed. This has led to critical thinking existing merely as an urban myth otherwise punishable by ‘reeducation’. Within these borders you know what to believe and when to believe it, there is nothing contradicting this learning environment. What I’m getting at is that in North Korea the Concrete Wall isn’t exactly a tough sell. Internationally, the United States and South Korea officially deny the walls existence. They acknowledge only anti-tank barriers at certain DMZ sections where populations of people are closely subset on each side, or at sections of strategic importance. Diplomats and even journalists have in the past been given unprecedented military access to these areas as an attempt to discount North Korean claims. This offer was even cheekily extended to North Koreans themselves, government or citizen. Nobody took up the offer. “If the walls existence were acknowledged internationally, there would be negative repercussions, that’s why they keep denying it” the Colonel argued, a brief and straightforward explanation. This, of course, is why we were here. Not to marvel at the walls beauty, history or it’s impeccable structural integrity — today’s privileged visit to the Concrete Wall is a cleverly disguised international vehicle for the ‘truth.’ Run home and spread the word Americans, your government has lied to you. During visits to North Korea I find one thing to be clear, that there is always an ulterior motive to sanctioned tourist visitations. Visiting statues of Kim Il-Sung unveils the extent of national endearment and compliance to Dear Leader, the local parks are generally filled with successful Pyongyangladites representing a higher quality of life, the Grand People’s Study House show us North Korea has computers, even network access, and the Three Revolutions Exhibition is a display of nuclear capability, while evidence of American war crimes lies inside the Sinchon Museum of American War Atrocities. Even the carefully selected supermarkets I’ve visited were fully stocked with Chinese goods, a nod to foreign trade and a far cry from the food shortage ‘rubbish’ you’ve heard on CNN. And the Concrete Wall? Akin to the captured American ship USS Pueblo docked with pride in the Taedong River, one of North Korea’s most influential political centrepieces, it’s proof of American aggression. The Concrete Wall also demonstrates proof of outward exile by South Korea, while of course, the Great Leader sits on his yacht falling over himself in attempts to reunify both Koreas. The Concrete Wall is perfect. The Colonel proceeded to commend us for our bravery in visiting the wall today and like an excited child eager to show off his toys, invited us outside to bear witness to this disgustingly transparent piece of injustice for ourselves. This is the view across into South Korea with the naked eye. The entire thing is a minefield. Do you see the Concrete Wall? It was a peaceful, clear day and the naked eye saw far into enemy lines where nothing of particular interest stood out. Small birds, sparrows, zipped passed my vision unaware of their residential danger. I was handed the binoculars. 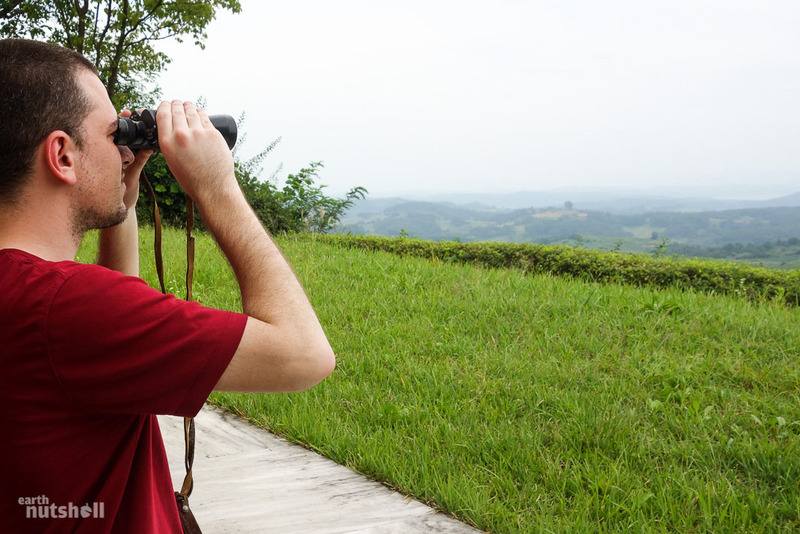 I must admit, I raised the binoculars as a critic. Call me even cynical. I challenge you not to be after even a short time within the hermit kingdom. North Korean tourism consciously bathes you in political bias and educational nurturing, it substitutes your reality with their own. So, to be confronted by a poorly cut wall stencil taped across the lens wasn’t too far-fetched an expectation for a country reminiscent of a living, breathing version of 1998’s The Truman Show. My sceptical face as I look across 4km of minefield into South Korea, a country so close yet seemingly worlds away. As I pan the landscape, soft orchestral music emitted from rusted old speakers once used to deliver unsavoury messages to those cowards ‘living in poverty and disease epidemic’ in the South. South Korean military installations in my sights splash painted signage: “Come and see for yourself!” A temptation for curious North Korean eyes. A minefield spanning east to west, you’d never have an inkling as dense green bushland concealed the evidence. The land was dissected only by mud paths lined with razor wire. South Korean soldiers gazed back from tall outposts, partially hidden not unlike mushrooms emerging from the shrubs below. 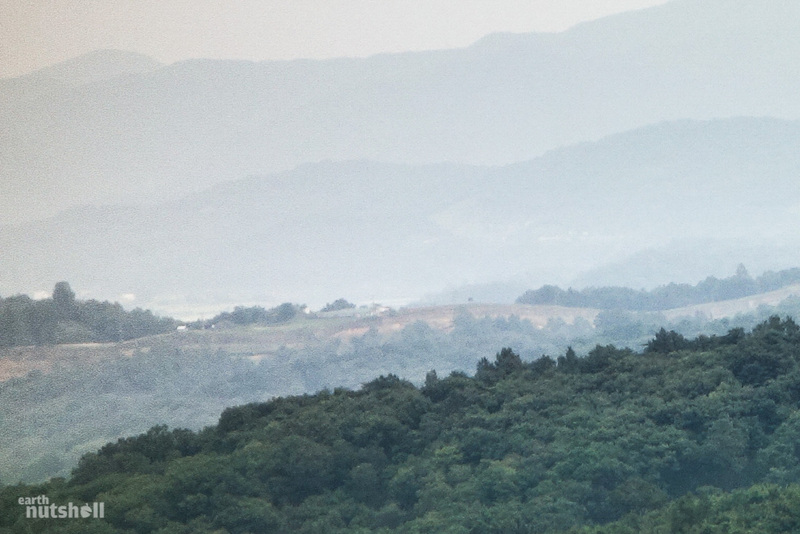 Two South Korean outposts far beyond the border facing me in North Korea. Like ants marching the hilltops, industrial buildings and even moving cars and were visible in the distance, representative of an economy 60 years North Korea’s senior. Only four kilometres away their position was only accessible to me as a 5,000 kilometre detour through Beijing, China. A sobering thought. 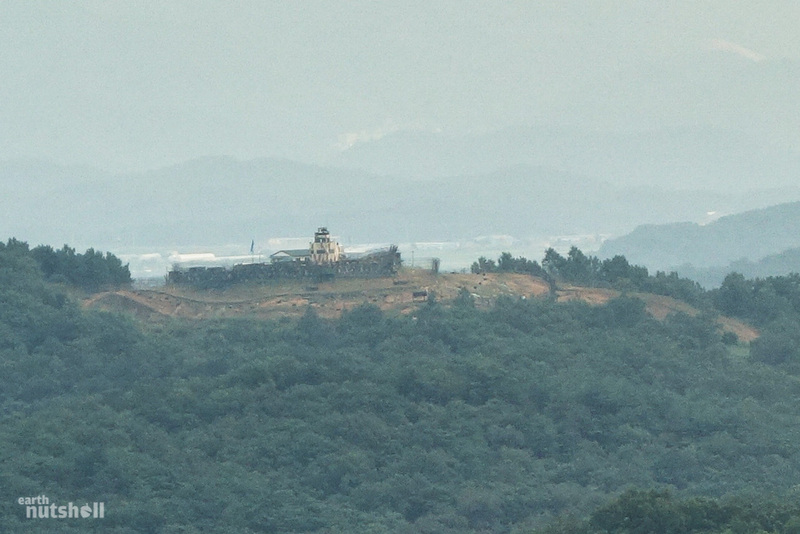 A South Korean barracks facing North Korea. Each was surrounded by a clearing of three layers of razor wire. Cameras, observation towers and bunkers all draped in camouflage dot the landscape, each with three perimeters of razor wire and electric fencing. Not the most inviting of neighbourhoods, but arguably still better than Detroit. Both the South Korean and distinctly blue United Nations flags sailed defiantly high above the installation’s walls. Could this be evidence of the fabled Concrete Wall? And then…I took this photo. The money shot, as they say. Deep inside enemy lines, thanks to the full zoom of my approved lens I captured what appears to be a wall. One that very well could be made from concrete. It was only a small section and it disappeared with the contour of the land into thick forestry on either side of the frame. Could this be what the North Koreans were talking about? Was the Concrete Wall more than simply a propaganda folk tale? Lean in and see what you make of it. Myth busted? Case closed? Possibly…to my surprise. Alternatively, maybe it’s not that simple. This is North Korea, a country so well versed in the art of misdirection that even David Copperfield would go broke. I felt there was more to the wall than meets the eye. Wikipedia mentions the Concrete Wall. Not exactly a primary source. But previous travelers to North Korea on TripAdvisor swear they’ve seen it, and two previously documented accounts of the Concrete Wall have come to the same conclusion that it exists. Yet, somehow facts remain limited and official statements don’t exist. Oh, and just as our prehistoric Scottish friend, photos are as scarce as hens teeth. Why? How can an architectural feat of this magnitude be so well hidden since 1987? Interestingly, on further investigation both of these documented accounts of the Concrete Wall viewed it from afar just as I did. In fact they were from the exact bunker in which I currently stood. Both documented accounts were guided by the same North Korean Colonel and each left with photographic ‘evidence’ remarkably similar to my own. So similar that their photos of the wall were almost identical, even from the same angle. 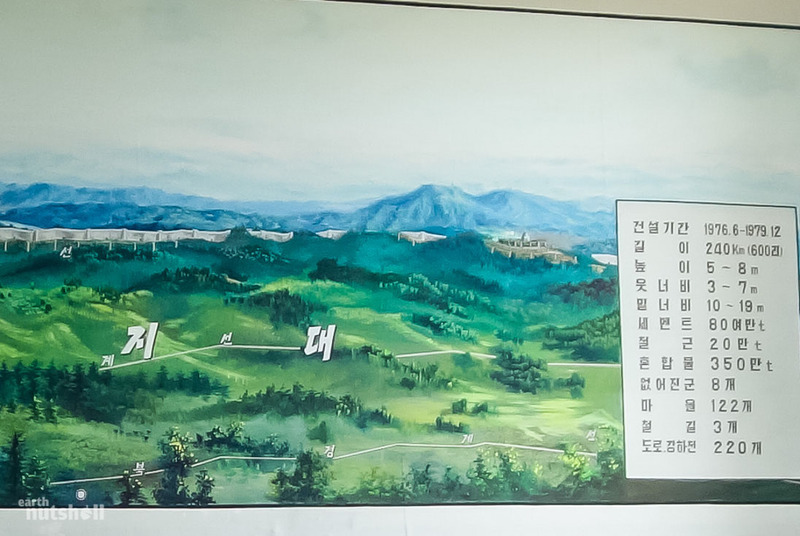 What I felt was most odd however, was that I had already visited the DMZ (the Joint Security Area) earlier today but to get a glimpse of the Concrete Wall I had to be driven one hour parallel into countryside North Korea. 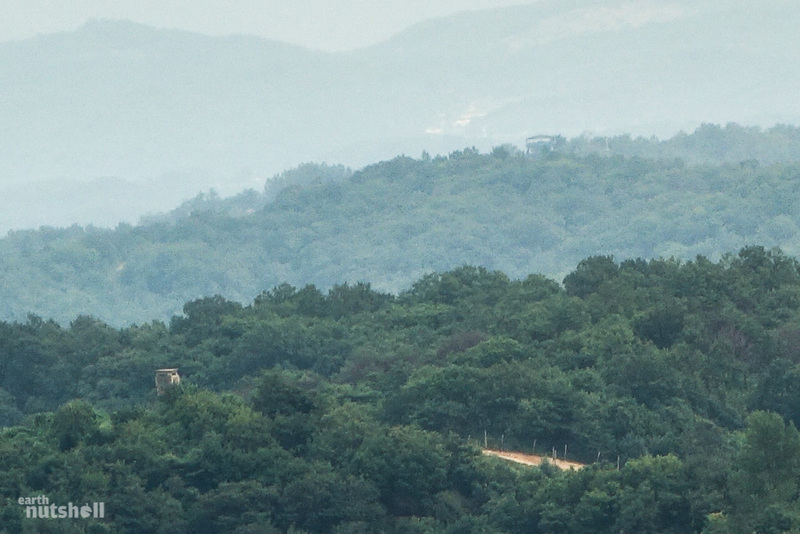 For a wall spanning the entire DMZ, you can’t help but wonder: Why only here? This was perplexing. 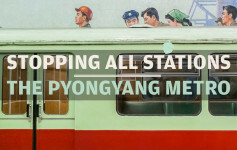 Venturing beyond the beaten path, beyond the on-rails sanctioned tourism façade down clean streets and sterile political locales was breaking the first rule of the North Korean playbook. Especially here, far from the ‘safety’ of Pyongyang. The detour displayed rural harsh realities of poverty, malnourishment and struggle. It was a questionable cost-benefit outcome, one that was previously controlled meticulously by authorities. Was the wall really that important? Photos I took on this detour were deleted at the border. Luckily for you, I had backups so here’s a couple from the bus window. They give a more accurate representation of what living conditions are like in this region. I witnessed this just prior to the viewing bunker, only kilometres from the militarised border. North Korean’s would rather foreigners don’t see this. For some reason, the wall’s importance justified the one-hour unfiltered drive here. Beyond the major cities cars simply don’t exist. Private car ownership is (for practical purposes) illegal, they represent an astronomical cost to the average North Korean. Nationwide fuel shortage and little disposable income reinforce cycling as the primary means of transport. Cement buildings of questionable structural integrity in a countryside town. Those are corn plants, a life giver in many areas of the country. 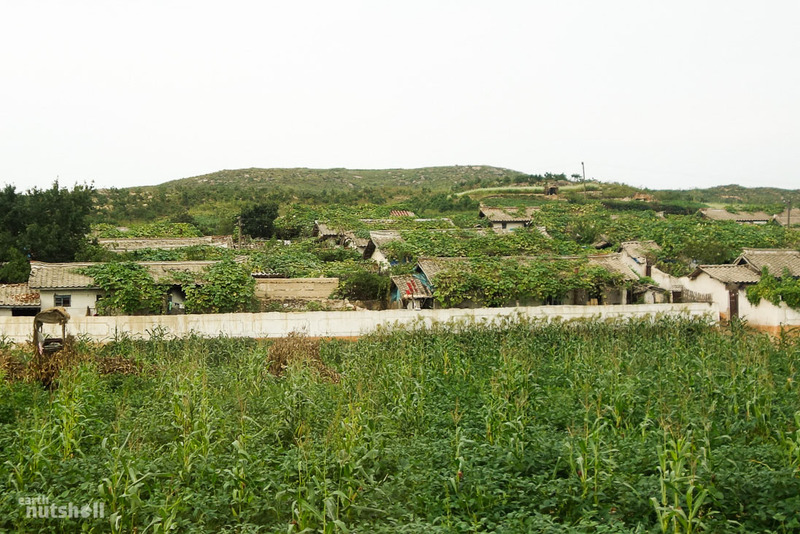 Another weathered farming community. 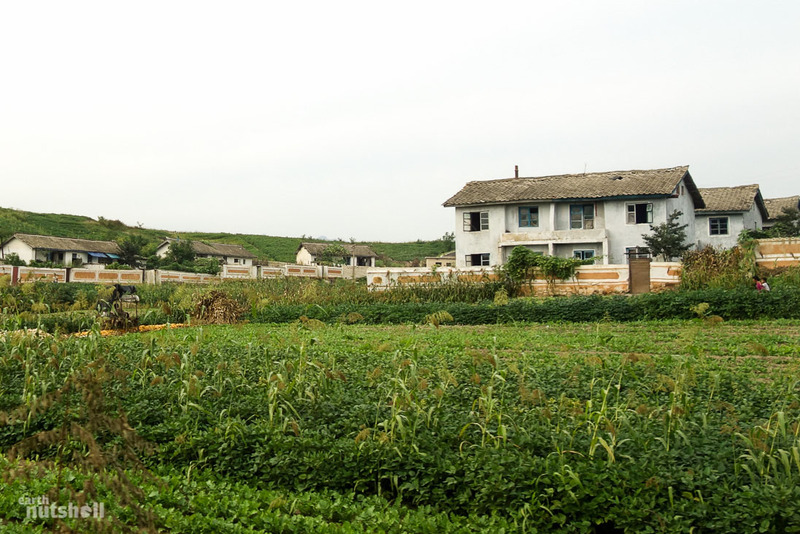 Farmland is sectioned, farmed and a portion of the crops is collected by the State. Aside from this carefully selected viewing bunker, other intricacies of the wall simply didn’t add up. North Korean authorities have long claimed the wall was unethically built both to prevent free passage of their citizens into the South, and as a platform for South Korean and American military aggression against them. In reality, the North has been the one to lay carpets of minefields to prevent their citizens from leaving, and the South have embraced North Korean defectors who’ve made it across unscathed. The Concrete Wall is also hardly a feasible platform of war, it would impede the South’s own military advancement. If what the North says is true, the entire premise of the Concrete Wall just seems counter intuitive. I can’t imagine a 5-8 metre wall is easy to traverse by a tank. And well, to hit the nail on the head…that’s exactly right. This realisation slapped me across the face. I’m no history buff, but let’s head back to June 25, 1950. Rhis was the date marking the beginning of the Korean War. Kim Il-Sung ordered his North Korean forces across the 38th parallel and orchestrated an invasion of the South, eventuating in the capital being captured in just three days, met with little resistance. This became known as the ‘First Battle of Seoul’. How does this relate? Well, it was a tank invasion. Take one guess where the tanks crossed. As the crow flies, Seoul is just 50 kilometres away and without barrier this was a natural weak point suitably exploited to begin the war. As George W. Bush once (attempted) to articulate: ‘Fool me once, shame on you. Fool me twice, shame on me’. And so, the gap was filled, tank barriers were erected and they’ve been acknowledged as such by both American and South Korean forces ever since. There is no wall. We were viewing tank barriers. We were being had, in true North Korean style. Just as the Loch Ness Monster, what began as hearsay and myth has manifested into a perceived, accepted reality with hard penned facts. Political motive and state theatrics ensured no limits. The wall has a tail, flippers and a long visible neck that can be spotted only at the right time, from the right angle, and only if you’re quick enough. 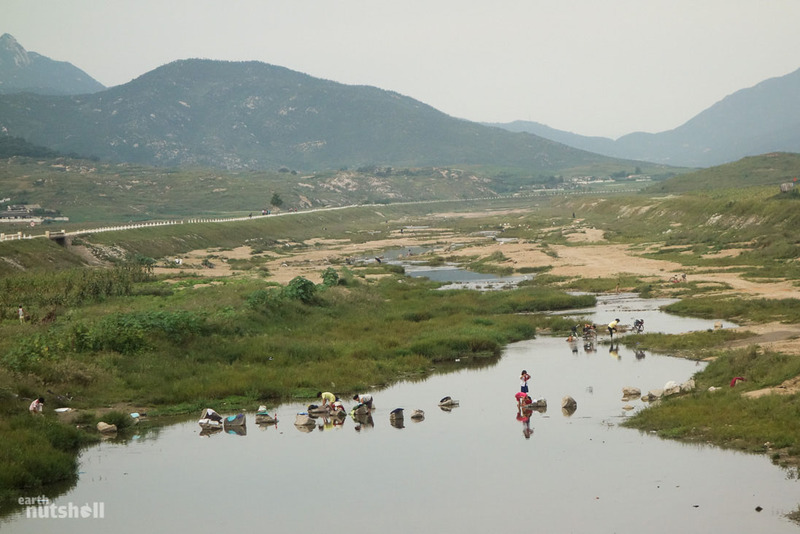 To quote the movie Swordfish, ‘what the eyes see and the ears hear, the mind believes.’ This is North Korean tourism. For the locals? Information is suppressed, citizens know as they’re told. The Great Leader is forged as a demi-god and is supported by an entire nation till death. The Concrete Wall can be as long as he damn well pleases. This one is happens to be 240 kilometres. Some minutes later, I got the tap on the shoulder. It was time to wrap things up. We had a busy schedule to stick to. Colonel Kim Chang Yun was stood to my right, his posture perfectly straight with not a blemish upon his militarised olive suit and novelty-sized peak cap. A plethora of medals sat upon his heart. He waited, intent on relishing in the reaction of what I had just seen, physical evidence of American aggression and transparent restrictions imposed on free passage into the South. “Do you see it?” he asked in Korean, translated by my guide. I’ve read two of your stories about your visit to North Korea and they are fascinating. The photos are also amazing, and I’m sure at least some of them were snapped on the sly which makes me wonder at your courage. Good work, and fine analysis of North Korean propaganda techniques. I don’t have much to add, but I have developed a keen interest in Korea over the last year or two and stories like yours are extremely interesting for someone like me to read. Thank you! I LOVED reading this story! I would love to shake your hand, Elliott Davies, for such an excellent job at exposing what really goes on in (the minds) of North Koreans. It is unfortunate, although not at all surprising, that you will never be allowed into North Korea again. 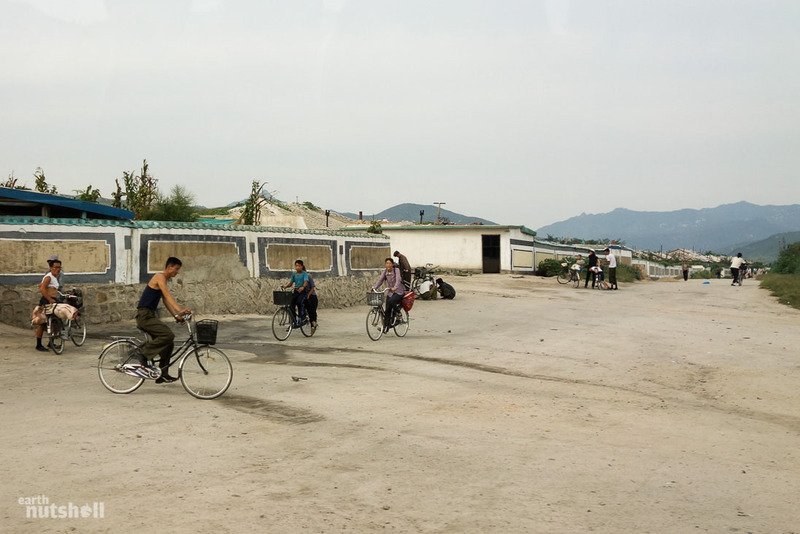 The wall…is quite real in the minds of North Koreans, but hopefully history will prove otherwise and allow these poor mistreated people to see the world for what it really is. Unfortunately, I will not hold my breath. Please email me directly, as I would love to communicate with you directly regarding this, and other things. Thank you for the enthralling and enlightening story! When I visited that same grassy knoll and looked out across the minefield to that small segment of wall, I didn’t really know what to make of it. Your explanation was a joy to read and much more informative than the North Korean colonel’s. I went a year ago and was indeed met by a different colonel. I’ve heard that a lot of the tour companies don’t normally go here, and just before we left, I noted my tour operator slipping the officer a carton of foreign cigarettes as payment for allowing our group access. Truth to the tale! Fantastic. I’m unsure why some tour groups avoid it. 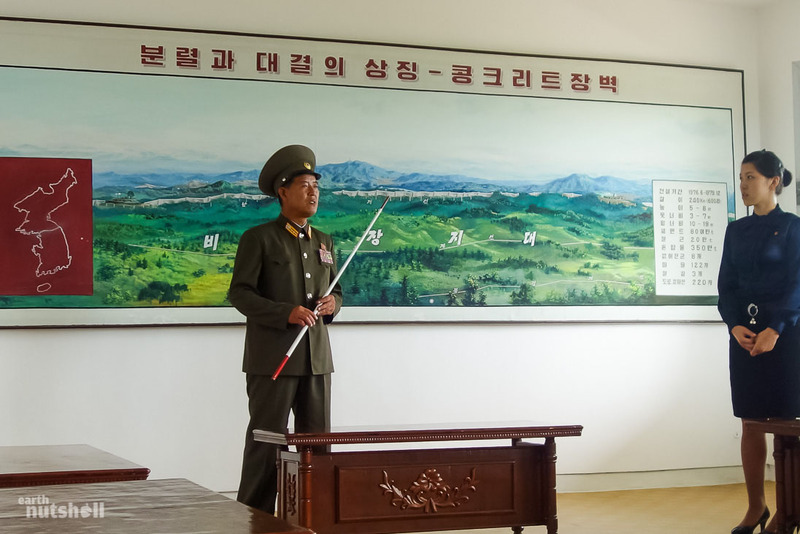 I’d guess time restrictions, as for most tourists the JSA visit ticks off the DMZ curiosity box…but you truly never know in North Korea, greasing some palms gets the job done. I am still flabbergasted they take you all the way out there at all, to be frank, haha. Hey Elliot – Thank you, what a great read! I have been to the bunker to see the concrete wall twice, and each time just like you I saw what you photographed and wondered errr so that’s the wall? It’s interesting to see you listed in what looks like Summer, the vegetation in the photos is very green. One of my trips was in November and most of the vegetation browned off and shrunk back due to the winter weather. You would expect in those conditions the wall may be easier to sight, ummm nope, just the same! Also thanks for the great description of Colonel Kim Chang Yun, he certainly is a character! I have spent all day reading these. Fantast insight. Thank you so very much. Thanks. It is most important to know NK and her stories. Since you are traveling many countries and informing us in your personal blog. It is incredible and lovely, we can learn many undisclosed facts. Now, is there any plan in near future to travel India? If you plan such, kindly visit dirt poor villages and see way of life and living standard. In India, leaders are faking masses and uttering all false promises to grab the high chair and later forget all those past promises. Main idea to mint money by corrupt practices,very unfortunate the dirt poor people of India.